Back in nail polish history there was time when finding holographic nail polishes was nearly impossible. There was a dry spell of holographic polishes I'd say around 2009-2012 before indies came to the rise. It was nearly impossible to find holographic nail polishes unless you went on eBay and were willing to shell out $$$$. 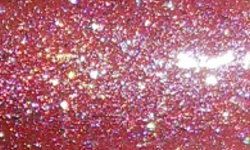 Milani did come to the rescue in early 2010 with there own little holographic collection. No, they weren't the same as some of the older holos nor are they as holo-riffic as what we have now, but they did their job. I still like them because I do find they're just a bit unique from many holos today. I have one of those colors to show you now. Digital is a soft pink scattered holo. Color: This collection ahd subtle colors, but I like this one. Pink is kind of neglected color these days especially in holo. The holographic effect in this one is very scattered and the particles are large. I don't see that in holos currently which is why I really like this one. The holo effect isn't strong, but it does have a unique and sparkly finish. Formula: This formula is very sheer. This was pretty typical of older holos. This took me around 4 coats to build up. Price: This isn't readily available anymore, but you can still find some online through etailers if you search. Overall: I like this old Milani polish. I know many people won't be wowed by it since there are so many amazing indie holos out now, but I think it's pretty special. I love the scattered glittery holo effect and the larger sparkly particles. The formula could be a bit better, but it's a cool polish and one I plan on holding on to. Love Digital!! Milani made some really nice holos.